“Oliver Wiswell”: an Authoritative Work? As stated before, I am catching up on Kenneth Roberts news in the blogosphere. I try to post on matters I find relevant and helpful to those interested in learning more about one of America’s least-known great authors. However, sometimes you’ve just got to post things out of the ordinary. If you want to know for certain that the American Revolution had absolutely nothing to do with freedom, just read the first three chapters of Oliver Wiswell by Kenneth Roberts. The American Revolution opposed freedom in every possible way. In reality, it was nothing more than an excuse to kill one’s neighbor and to burn down his home. While I believe that Roberts was faithful to his commitment to accurately portray historical events (which I believe is backed up by his tedious research), I’m not sure how far one is to take the fictional aspect of his work as authoritative. The chapters Yordy refers to, if I am not mistaken, are written from the perspective of the fictional character, Oliver Wiswell, who is a Tory living in America during the Revolutionary War. The character gives his view, as a Tory, on the war. While chapters 1 – 3 are technically Roberts’ words, he intends to portray common Tory sentiment of the war. On the other hand, I believe Roberts himself would side with the “rabble” who fought against England. This issue raises the question on the role of historical fiction in one’s research and support. If historical fiction is written in the manner of Kenneth Roberts (backed by significant research and historical facts presented as faithfully as possible), can it be used authoritatively? At the very least those parts that are historical fact in nature, as opposed to fiction written with no intention of presenting any historical fact (I am sure there are numerous forms of fiction; here I use “fiction” in its most general form, as a story made up by its author, not reflecting any true person(s) or even(s))? Personally, I believe one treads on shaky ground if he bases an argument, in part or in whole (and outside of the realm of literature and the arts), on historical fiction; however, my opinion may be a result of my doctoral studies in which any reliance upon fictional works is frowned upon. Kenneth Roberts’ Estate: Rocky Pastures AND a Cottage! Interested in knowing more about Kenneth Roberts? While there is little on the internet on him (hopefully this website remedies that to some extent), people in Maine still seek to keep Roberts’ legacy alive. According to A Guide to Maine Museums, some (or all?) of Roberts’ estate is kept at a Kennebunk, Maine museum called the Brick Store Museum. Oh, to be able to visit Maine for more than two days (as I did in August 2009)! If you have a chance to visit beautiful Maine, stop by Kennebunk to visit the Brick Store Museum. 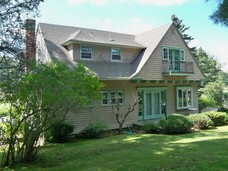 Speaking of Roberts’ estate, I got to wondering if his house in Kennebunk had sold. So, I Googled his info and stumbled across a real estate site that listed “Kenneth Roberts Cottage House at Kennebunk Beach.” It’s only listed for $840,000! You can view some pics of this cottage here. So, not only did Roberts live at 39 Rocky Pastures Rd in Kennebunkport, ME, he had himself a nice little cottage as well. Speaking of Roberts’ Rocky Pastures estate, it’s still for sale for a mere $2.7 million.